Will ZF and SeaVee shake up the boating world with their single-pod center console? One of the best things about the Miami International Boat Show is that it’s so big, I always find at least one thing there that I never expected. This year the surprise was a 34-foot center console with a single-diesel pod drive. The boat, a joint project of SeaVee Boats and ZF Marine, attracted a lot of attention at the Marriott Marina, where it was available for test rides. 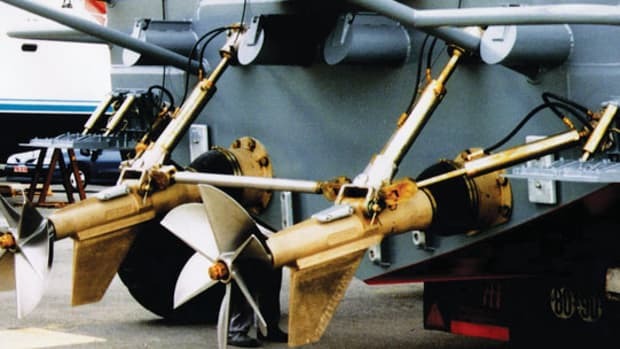 I had a special interest in the rig because I used to own a 34-footer powered by a single diesel, and since she lacked a bow thruster, I often daydreamed about what a single pod would do for her rather quirky low-speed maneuverability. Back then I even broached the prospect with some Volvo Penta engineers, but they shot it down on two counts. One, despite the fact that the IPS software can accommodate triple and quad installations, it apparently is not amenable to single-pod operation. Two, the hydrodynamics of the IPS drive are not very efficient at the displacement speeds my boat was restricted to. Indeed, the engineers warned that I might even see a decrease in efficiency. ZF’s smallest pod drive has many of the same features found on the company’s larger units. A horizontal input flange (1) connects to an intermediate shaft that connects in turn to the engine. 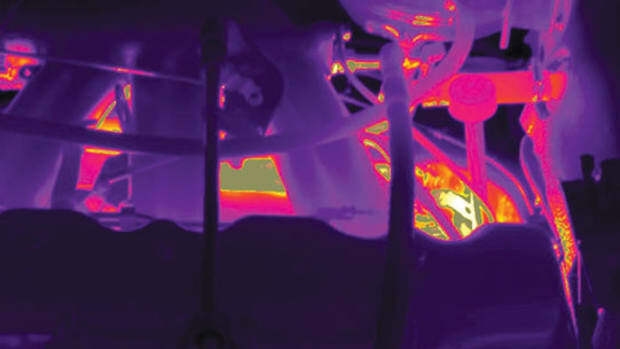 Efficient cooling and corrosion protection are ensured by an integral heat exchanger (2). The mounting flange (3) fits into a hull cut-out whose dimensions are supplied to the builder. To maintain integrity, the skeg (4) can break away on impact and be easily and cheaply replaced. Drive efficiency is ensured by aft facing, counter-rotating, stainless steel props (5). In this application, the drive can rotate through 180 degrees. This installation, I discovered, handily sidesteps both obstacles. First, it employs the new 2800 Series pod from ZF, the smallest pod the company offers and one that is programmable for use as a single. 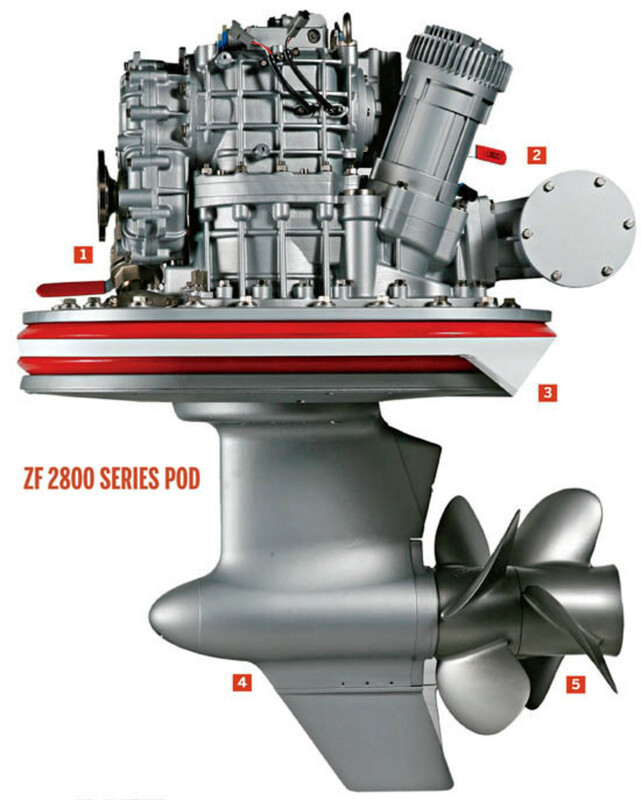 Second, SeaVee’s 340 Series is anything but slow. Whether rigged with dual or triple outboards or single or dual diesel inboards (or as an open or cuddy) the boat can fly. 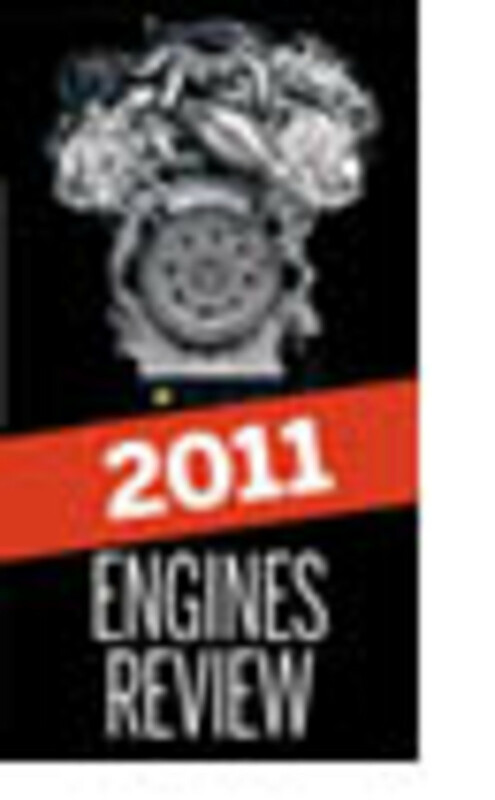 Since the motive power in this case was a 480-hp Cummins MerCruiser diesel, exceeding displacement speed would not be a problem. ZF programmed the 2800’s software to allow it 180 degrees of movement—90 degrees to either side of centerline—when the helmsman selects Easidock mode on the ZF electronic control. This also limits full-throttle operation to 930 rpm (about six knots) and transfers steering from the wheel to the ZF joystick. 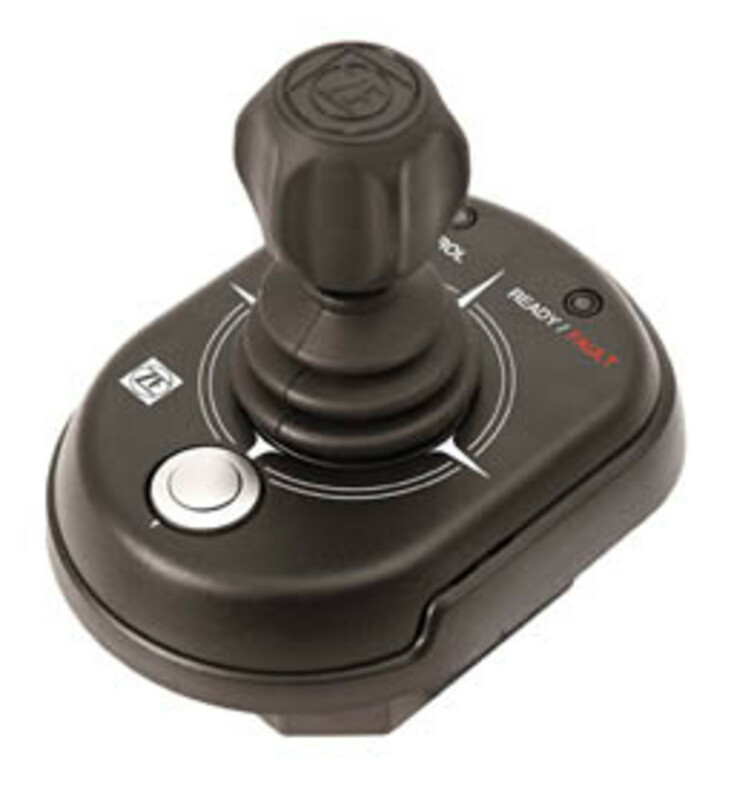 Twisting the joystick not only rotates the pod but also activates the ZF 185 electric bow thruster. When Easidock is not engaged, pod range is limited to 60 degrees—30 degrees to either side of centerline—to preclude imprudent high-speed maneuvers. Move the single-lever control forward, and as the diesel throttles up, Easidock automatically disengages. While the SeaVee was available for rides during the show, neither ZF nor SeaVee were willing to allow an actual test of it —i.e., fuel consumption and speed data—as it wasn’t dialed in. (In early April, the tweaking was continuing.) While the demo boat performed admirably, replicating the precision pirouettes we’ve come to expect from multiple-pod installations, there were reports of proportioning issues, principally the bow leading the stern during lateral movement. It’s worth noting that the thruster is proportional; the amount of thrust varies with the amount of twist in the joystick. The ZF system also includes an electronic compass designed to eliminate yaw. Balancing these two factors is largely what is involved with the testing and tweaking. 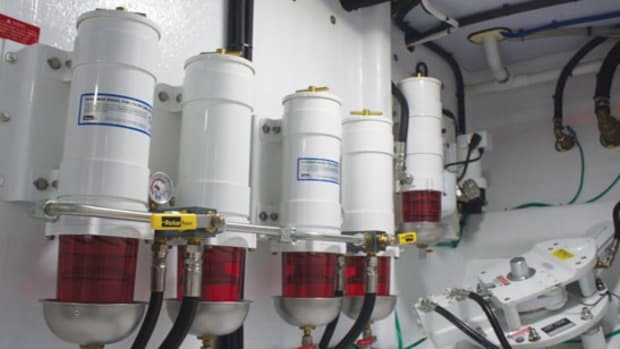 SeaVee was a natural partner for this installation as it was an early adopter of IPS and currently offers it as an option on its 39 center console/cuddy and 43 express. 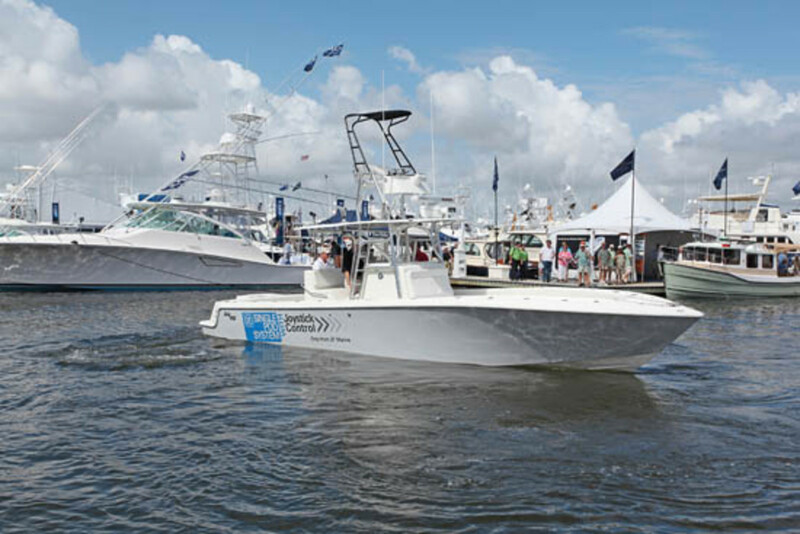 SeaVee vice president of sales Ariel Pared’s personal boat is an IPS-powered 390 center console, which he regularly enters in tournaments, and he claims the company is the only center console builder currently offering pod drives. Pared is building a single-pod 340 as a replacement for his 390. The big advantage of this package is its combination of fuel efficiency and maneuverability, one likely unmatched by other boats in its class. But it comes at a cost. While pricing had not been firmed up at presstime, reports had the base at around $207,000. That’s a lot of money for a 34-foot center console but not out of line when you consider the cost of the diesel engine and the fact that SeaVee is a premium brand. Its boats feature vacuum-bagged PVC foam and reportedly spend from seven to ten days in the mold to ensure full curing. 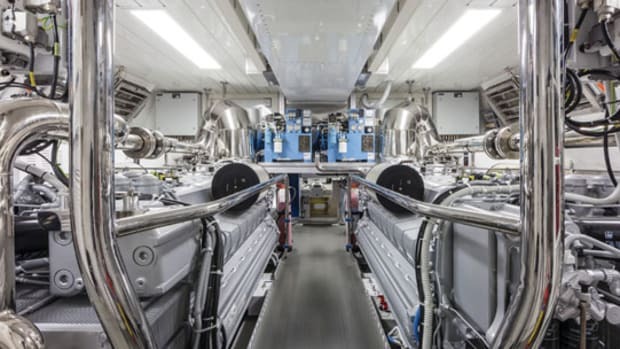 Consider also that part of the single-pod package is ZF’s iAnchor station-keeping function, which can reportedly maintain boat position to within a three-foot radius. 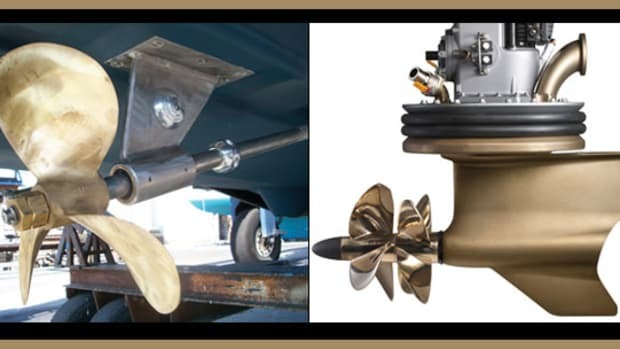 Anyone who’s ever tried to hold a single-engine boat—even one with a bow thruster—in position while waiting for a fuel dock or bridge knows what a huge advantage that could be. All up, this boat is an impressive accomplishment. Will it make single-pod drive a viable option for boats under 35 feet? That depends on its performance numbers and whether prospective buyers can demo it and actually feel how the boat reacts. Even absent test numbers, I have to admit that I’m intrigued.